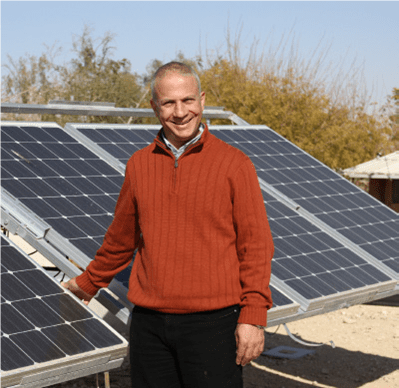 I am very proud to come back to the Arava Institute as the Academic Director, and to be part of an institution that gives students and future leaders the intellectual skills necessary to understand and solve environmental problems on a local and global scale. The Arava Institute is a unique academic institution with inspiring faculty, researchers, students, alumni and staff. The institute has been around for 20 years and is one of the first environmental studies programs in the Middle East. At the Arava Institute we prepare future leaders who understand and respect the interactions of humans with their natural environment, leaders who look onto challenges from an exceptional transboundary and interdisciplinary perspective. All of this to serve our environment is a responsible way. The region we live in faces many environmental problems that affect our urban, agricultural and natural systems. These problems include complex and interdisciplinary issues such as: political, economic, social, as well as scientific aspects. The Arava Institute offers an accredited university-level semester or yearlong program for both undergraduate and graduate students. Our natural and social environmental sciences courses are taught by and under the guidance of leading environmental professionals and academics; courses focus on the areas of sustainability, research methodologies, water management, renewable energy, ecosystem management and conservation, ethics, sustainable agriculture, human and environmental health, environmental politics, and more. In addition to the classroom experiences, our students are given the opportunity to get out into the field: during transboundary field trips, students meet with experts on regional environmental issues and conflict resolution, hear from local stakeholders, and visit historic sites. I am very excited to be back to continue to serve the Institute as a researcher and lecturer and to continue my research in the field of renewable energy and energy conservation. I believe that the experience I had at the Israeli Ministry of Science as Deputy Chief Scientist, and later as the Acting Chief Scientist will be a great and important tool that will assist me to be an active member of the team who aims to take the Arava Institute a step forward toward being an excellent academic and research Institution. The cross- and multicultural setting of the Institute and the experience I gained at the Arava Institute were major factors that allowed me to be the highest ranking Palestinian in the Israeli government. As the new Academic Director I will continue to work hard to establish high standards to advance our institutional purposes and values. We have a very special and challenging obligation in a very difficult time. May we and our future leaders embrace it. I wish all of us a successful year!